Prepared by Prepared by Lee Scott-Virtue, President, founder & field coordinator of the KTBs & Sandy Boulter, coordinator & founder of Perth based Friends of Kimberly Toad Busters. AUSTRALIANS NEED A NATIONAL CANE TOAD THREAT ABATEMENT PLAN (TAP) NOW! This 28 th Kimberley Toad Busters’ Newsletter is produced by Kimberley Specialists In Research Inc in conjunction with Kimberley Toad Busters Inc. Kimberley Specialists, a founding member of the Kimberley Toad Busters, continues to support the campaign against the cane toad by supporting www.canetoads.com.au, raising funds and supporting cane toad scientific research. KTBs are a tax deductible entity. Please see our website for our direct donation facility or how to sponsor one of our research projects. KTB Honour box: Jordy Groffen. Toadbusting: A Unique Research Undertaking / Understanding Cane Toad Invasion Mechanics. Lungworm Parasite Infection of Cane Toads. New Parasite Discovered In Cane Toads. Reptile biodiversity in the East Kimberley and Impacts of the Cane Toad by Lyall Grieve. Trialling/ describing safe handling/ humane safe disposal of cane toad metamorphs and adults. Support any request from biodiversity/cane toad researchers for field support/samples. Canetoads love to eat bees. 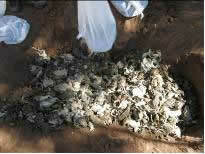 DEC is now proposing to ban KTB tried and true toadbusting methods in Western Australia. KTB researcher produces further work that rebuts previously held hypothesis that lungworm parasite way behind front line toads. KTB researcher discovers parasite not previously described in Australia. KTB researcher shows how to deliberately infect cane toads with lung worm parasite. KTB toad count = Just over 4,000 mature toads. KTB volunteer hours at front lines reaches 592,012 volunteer hours. WA Draft CANE TOAD STRATEGY out for public comment, comments due 25 June 2009. Federal Government finally proposing National Cane Toad Threat Abatement Plan. Lee Scott Virtue President of the KTB Board and founder of the KTBs, and Sandy Boulter Administration officer of the KTBs: 11 June 2009. This newsletter celebrates KTB research and educational achievements as at 11 June 2009. Since December 2008, our campaign has continued and grown securely with financial support of the Western Australian government led by Premier Colin Barnett, Deputy Premier Kim Hames and Environment Minister Donna Faragher. 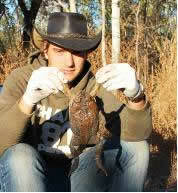 Student Jordy Groffen, after browsing www.canetoads.com.au from snow bound Holland, on his own initiative contacted the Kimberley Toad Busters in 2008 to ask if there was some way he could undertake research with the KTBs that could be incorporated into his degree course in Animal Husbandry, animal science and animal management at INHOLLAND University, Delft in the Netherlands. KTBs overcame the travel visa challenges that this novel application brought with it. All 6’7” of Jordy has made a lot of friends in the East Kimberley community. His fun loving, non-complaining way of getting down with the serious business of cane toad Parasite Lungworm research, and later flourishing in a completely foreign, harsh and challenging hot East Kimberley and Northern Territory wilderness has garnered the admiration of all who know him. We doubt there is anyone outside Australia (or even many Aussies) who could navigate the remote Victoria River catchment, NT National Parks and Pastoral Leases as safely without getting lost as Jordy now can. He has become an outback survival expert, toadbuster and toadbusting leader extraordinaire. Jordy’s willingness to get out there where it counts in the harshest of condition is what has delivered the parasite research results. discovered how to deliberately infect cane toads with the lung worm parasite. Jordy has dissected thousands of cane toads over 4 months in each of 2008 and in 2009, and set up experiments to find out the best way to deliberately infect cane toads with the lungworm. Jordy has been sponsored by Kimberley Toad Busters, Kimberley Specialists in research and East Kimberley Tours (see this newsletter for the science). 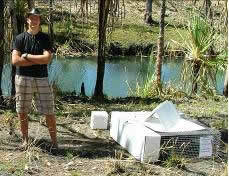 Photo left: Jordy with the field based traps in which he deliberately infected cane toads with the lungworm parasite. Photo left: toadbusting with the Derby Rangers. It is has been suggested by some that toadbusting cannot make a difference. The rate of the toad invasion front is now showing signs of slowing down. 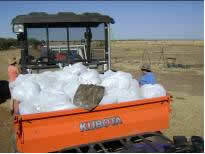 Developed new humane/safe catching/disposal techniques, and made DVD recording of CO2 process for assessment by government department: see online Fact Sheet at www.canetoads.com.au for comprehensive description of KTB CO2 operating procedure. 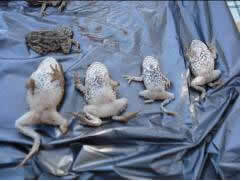 Photos L>R: 15 – 30 (depending on size) cane toads per bag, blow up with CO2, Tie balloon knot and leave for at least on e hour. (It is likely that the toads die of anoxia while asleep from the gas). 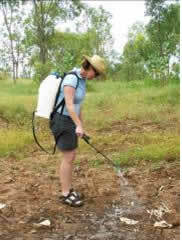 Photo: KTB volunteer with dettol solution in battery powered backpack that can kill millions of cane toad metamorphs hydrating on damp mud humanely, safely and effectively in a short time frame. This KTB management tool has seen the decimation of cane toad numbers at the colonising front lines. Promoted frog vs toad identification expertise in the East Kimberley long before toad arrives: online and in publications. Supported research into the lungworm parasite, auditory attractants, new trap design, small reptile impacts. The lungworm parasite could reduce the impact of the westerly moving invading cane toads, on WA biodiversity and slow the rate of and reduce the impact of the cane toad invasion of Western Australia. Shown that KTB frontline toadbusting has caused the lungworm parasite to start catching the frontline cane toads, which up to this time had outrun the lungworm parasite and remained strong and healthy invaders. This very important project reveals the lungworm parasite as an important tool in the toadbusting armoury. Our parasite project has shown that the lungworm is much closer to the front line toads than thought by other scientists. Jordy’s research has shown that our KTB toadbusting has slowed the invading front line and caused the lungworm parasite to catch the frontlines. Photo: Researchers Jordy Groffen (cane toad autopsy for lung worm parasite) and Lyall Grieve (cane toad autopsy looking at cane toad and small reptile diet) in the field, with KTB volunteer and KTB Board secretary recording data as called by the researchers. Kimberley Toad Busters and Kimberley Specialists in Research 2 year partnership with DELFT University in Holland through student Jordy Groffen has delivered these remarkable results. 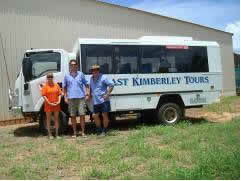 Funding for Jordy’s project has been made available in part from EK Tours and in part from the WA government. While undertaking autopsies on cane toads looking for lungworm parasite infections, our researcher, Jordy Groffen has serendipitously discovered a new pentasome in the toad, never before discovered in Australia. One of Australia’s leading amphibian parasitologist researchers will work with the Australian museum later this month to identify the exact species of pentasome that Jordy has discovered. Whether or not this will have ramifications for cane toad control is yet to be understood. An auditory attractant could increase toadbusting effectiveness. KTB volunteers have been working on isolating the various elements of the male cane toad call to try an ddetermine which bits call, repel, signify danger etc etc. Four units have been built and should be in field trails by July this year. Current traps use light to attract insects, which both attract cane toads. Water and pet food and rotting carcasses are also very attractive to cane toads. Mr. Groffen hopes to undertake a sound recording project of toads that are infected with the lungworm parasite. And see if there are any difference between infected toad calls and non infected toad calls. Mr. Groffen will help them with tracking down the infected toad populations. Lyall Grieve from Macquarie University has been researching reptile biodiversity and the impacts of the Cane Toad with the Kimberley Specialists and Kimberley Toadbusters organisations since late 2006, with the majority of work being done during 2007 and 2008. The 2009 field trip is in the planning stage. . Lyall’s research has indicated a strong reduction in small reptile diversity, particularly those that share the riparian habitat with toads. . Confirmation of reductions in numbers and extremely high mortality rates of larger predatory reptiles has also been ascertained from Lyall’s research. 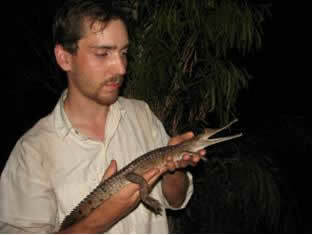 The 2008 discovery of Pygmy Crocodiles in Lyall’s research s has opened up further lines of research particularly with the behavioural and observational data acquired. The faster than expected encroachment of the cane toads into the pygmy crocodile habitat must be taken as an urgent call for action and research. 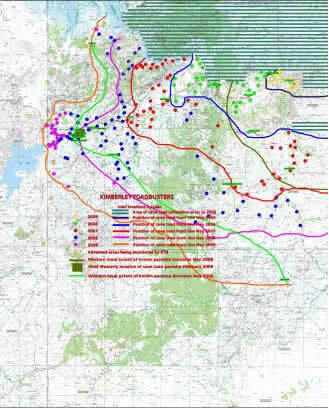 Kimberley Toadbusters has facilitated Lyall in a research programme to monitor the impacts and changes that will occur to the Pygmy Crocodiles and the ecosystem as whole prior to and after cane toads will, impact on their habitat systems. KTB research has identified and recorded appropriate, non-violent and humane methods of safe toad catching and disposal. 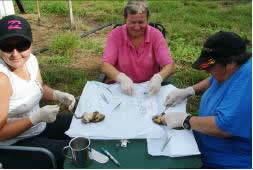 We catch cane toads using surgical gloves for direct catch, nets, hand-held pincers and any other method that assist people who have an aversion to actually ‘touching’ amphibiam speciies. .
We euthanase our adult cane toads with CO2 for number of reasons. It is humane and non-violent and assists our large indigenous and on-indigenous youth to understand that the cane toad cannot be blamed for its presence on our Australian landscape and that it needs to be respected. We spray metamorph cane toads (just after tadpole stage) with a dettol solution applied widely and comprehensively by fire fighting battery powered back packs during the daytime when metamorphs are the most active. This is also the time of the day when native frogs juveniles and adults) and adult toads have hibanated out of the heat of the day. KTB obsevatations have also determined that most native biodiversity) insects etc are also no longer obvious and those that are do not seem to be impacted by the dettol spray. 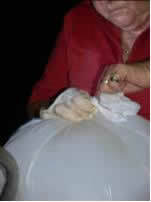 All night toad busting in the same areas after spraying has seen no impact or loss of life of native species. These tried and true techniques have been supported and even used by the WA DEC cane toad team for 4 years. The toads have now crossed the WA/NT border and DEC has now advised us that they are not satisfied with these techniques in WA but offer no acceptable alternative. KTBs are in the field throughout the ear and can support any requests for field support or samples on demand. 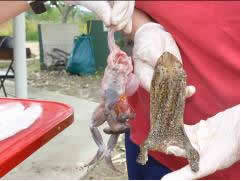 KTBs have supplied toads, toad hearts and livers and toad skins for research. 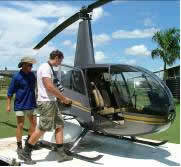 MCH Australia is a large export company that is trying to find a market for toad leather. 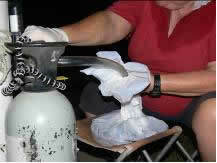 They are undertaking research on the chemicals in the skin of the toads. Their chemical pathologist has been looking into the area of possibly using one of the chemicals in the skin as a drug that may be able to aid recovery of patients after surgery. MCH want to know if there is any different between the chemical of toads that or infected with the parasite or the one that are not infected. In areas where the Australian native bee is found with cane toads, the main diet of the cane toad metamorph is this tiny bee. 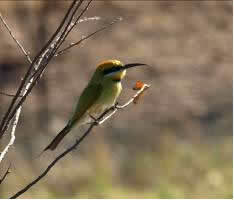 The main diet of the Honey Bee Eater (Rainbow Bee Eater) Bird is bush honey produced by the Australian native bee. An important and favourite bush food for the Aboriginal people is the bush honey, known as sugar bags. The cane toad will also use up the Honey Bee Eaters’ habitat. The Honey Bee Eater makes its mud hole nests in the sides of creeks, where large cane toads hibernate during day. Toads will decimate the introduced bees brought into Australia to pollinate crops. The WA Museum has recently released “NATIVE BEES ON WILDFLOWERS IN WESTERN AUSTRALIA” Terry F. Houston. Do you have a cane toad bee story that you could email us for our newsletter?